Welcome To The Jungle...in Dublin! It was Guns N' Roses vs angry, bottle-throwing fans at the O2 Arena in Dublin, Ireland last night, and the fans won. Or lost, depending on how you look at things. 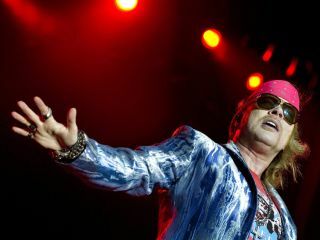 In any event, the volatile Axl Rose, in classic form, bolted after just a few songs. Guns N' Roses were scheduled to appear at around 9:15pm, but they didn't walk on stage didn't until 10:25pm, and when they began their opening number, Welcome To The Jungle, the fed-up crowd let loose. In the above NSFW video, a roadie is clearly visible cleaning up something or other from the stage at 1:23 seconds in. Only moments later, at 1:32, Rose told the band to stop playing and addressed the audience: "All right, here's the deal: one more bottle, we go home. It's up to you. "We would like to stay. Do you want us to stay? We want to stay. We want to have some fun. If you don't want to have fun all you've got to do is let us know - we've got no problem - and we'll go on our way." Then he told the the band, "Start over." Three songs later, Rose walked off. As you can see in the video, an arena official came on stage and announced that the venue was trying to sort out the "technical difficulties" - only the crowd wasn't buying it. Then a member of the staff or one of the promoters came on to say, "We're trying hard to get Axl back on stage. I would ask you to refrain from throwing items at him. I promise you a great show, but you need to calm. I'm sorry about this." According to reports, the band sans Axl did return to the stage to play a short set, but by then most of the fans - or now non-fans - had already left.